’Ewa Makai Middle School is located on the south coast of the Hawaiian island of Oahu. The school opened its doors in January 2011. In just over a year, it earned high honors for green building construction and environmentally-focused academics. Construction began in July 2009. From the start, the school was designed and built to meet the strictest green building standards. ’Ewa Makai has earned LEED (Leadership in Energy and Environmental Design) Gold certification from the U.S. Green Building Council for its use of recycled materials, use of natural daylight, and energy- and water-saving lighting and plumbing fixtures. In addition, cleaning products, furniture, and computers meet green certification standards, and 60 percent of school waste is composted, using worms and barrels to produce fertilizer for the school garden. Paperless classrooms make wide use of iPads, PowerPoint presentations, e-mail, e-books, and laptops. 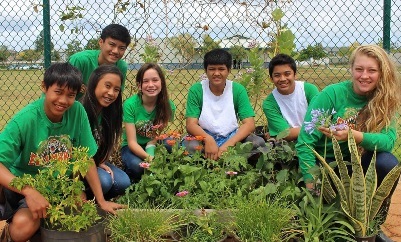 The school’s focus on the environment earned it a Green Ribbon School designation from the U.S. Department of Education. Learning at ’Ewa Makai is project-based, with teams that focus on Science, Technology, Engineering and Math (STEM) skills. The school’s science classes cover aquaponics, solar cells, solar cars, windmill generators, ecosystems, and robotics. Seventh-grade students constructed raised garden beds out of recycled materials, and used them to raise herbs, vegetables, and watermelon. They’ve made soups, salads, and kale chips out of their harvest, which they have shared with teachers and fellow students. To involve parents and community members, the students sponsored a Community Gardening Night, where they gave away lettuce, onion, radish, and tomato seedlings—and soil to grow them in—to 200 attendees. All this makes for a very green school, based on a very green blueprint.